Acrylic Mirror Sheet by Industrial Plastic Solutions. 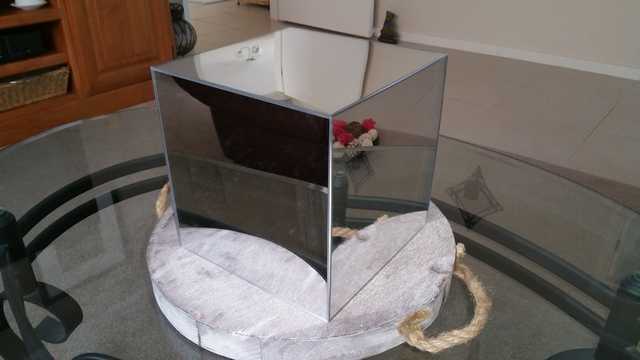 IPS are Melbourne’s prime supplier of high quality Coloured Acrylic Mirror Sheet. We stock Silver Mirrored Acrylic sheets in thicknesses of 2mm, 3mm, & 6mm. Coloured Acrylic Mirror is available for all types of applications. From Architectural Projects, Decorative panels or signage we can help. Sheet sizes available in standard 2440mm x 1220mm. Also available upon request are over-sized Acrylic Mirrored sheets at 3050mm x 2030mm. • Silver in 2mm & 3mm. Available upon request are half sheets, quarter sheets as well as a cut to size service. In most cases we can cut the Acrylic Mirror panels you require while you wait. Advantages of using Acrylic mirror are that you are able to drill, machine, cut it as well as bend and fabricate. Uses include plastic signs, point of sale displays as well as plastic shower mirrors. Cleaning can be performed by using a mild dish wash detergent combined with water and a soft cloth, or by using one of our specialized cleaners. Things to know about Acrylic Mirrored Sheet are that when installing larger sheet panels if not installed correctly you may obtain a wavy reflection. In order to help minimize this you need to first install on a flat MDF board using a quality Mirror adhesive that we have available in-store. Our experience staff are happy to answer any questions you may have in aiding in the installation process.